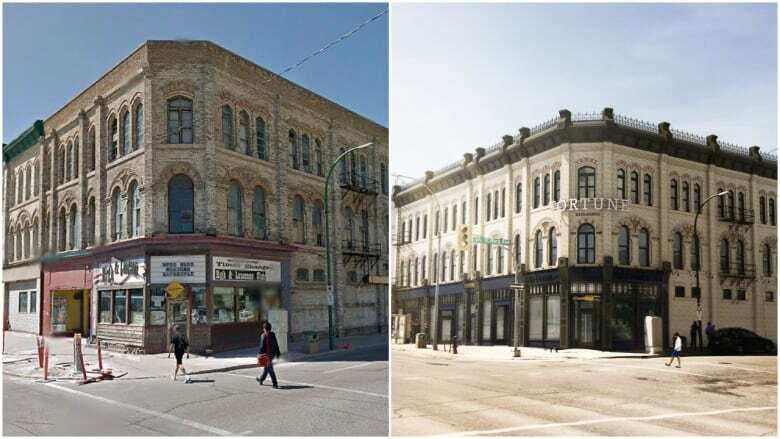 Restoration work on two of Winnipeg's oldest commercial buildings has yielded surprises, like the trunk of a pine tree serving as one of the structural columns. The Fortune/Macdonald Blocks as seen in 2012, left, and the future. 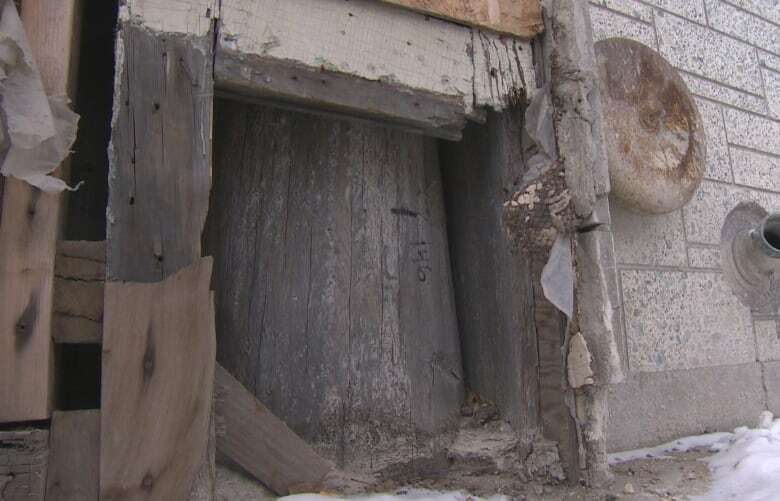 Restoration work on two of Winnipeg's oldest commercial buildings has yielded surprises, like the trunk of a pine tree serving as one of the 135-year-old structural columns. The Fortune Block (built in 1882-83) and the adjoining Macdonald Block (built in 1883) are almost as old as the province itself. Standing at the corner of Main Street and St. Mary Avenue, the three-storey buildings are a short walk from the original Red River settlement site of Upper Fort Garry. After decades of neglect, however, their age is showing with broken windows, crumbled plaster and heaved floors — a condition which had them briefly destined for demolition to make way for a new 150-room extended-stay hotel. That fate was averted, though, when the city declared them heritage buildings in early 2016. 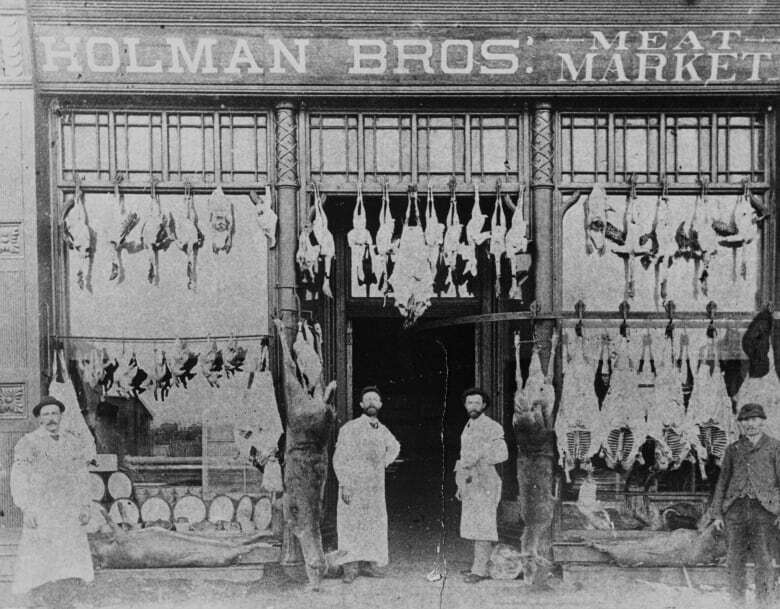 With the hotel developers no longer interested in buying the buildings, local businessman John Pollard stepped up to preserve them. 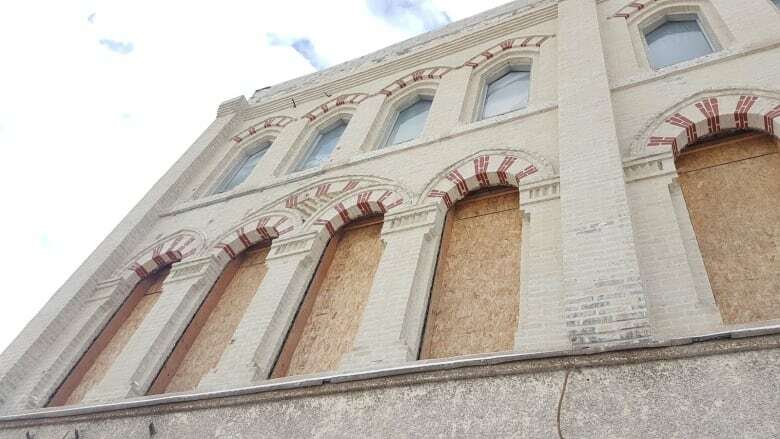 "We think they are beautiful buildings and it's nice to save a piece of history," the co-CEO of Winnipeg-based Pollard Banknote said. 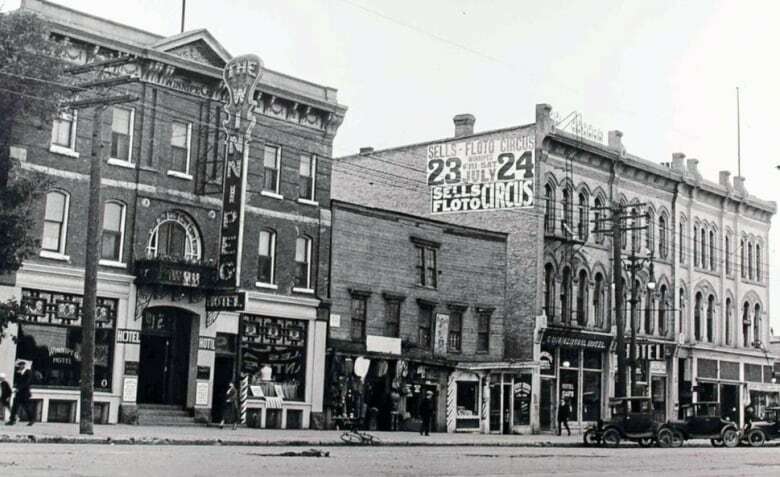 He also purchased the Winnipeg Hotel, south of the Macdonald Block on Main Street, and the empty lot between them. The future of the hotel — built in 1872, two years after Manitoba joined Confederation — might not be as auspicious. "It's still to be determined if it's really salvageable. We don't know yet," Pollard said. He won't know until he officially gets the title to the property this year and can go inside for a closer look. 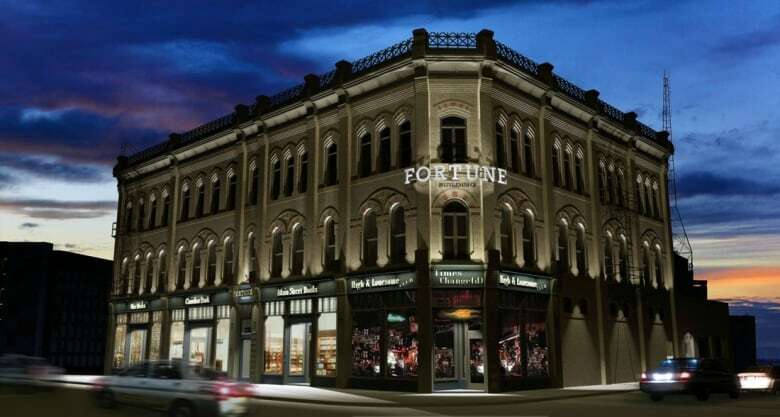 In the meantime, he said the renovation process is "going full steam ahead" on the Fortune and Macdonald blocks, with a loose target for a grand opening by the end of 2018. The exterior brick has been blasted clean of grime and windows have been replaced, while more extensive work is being undertaken inside. 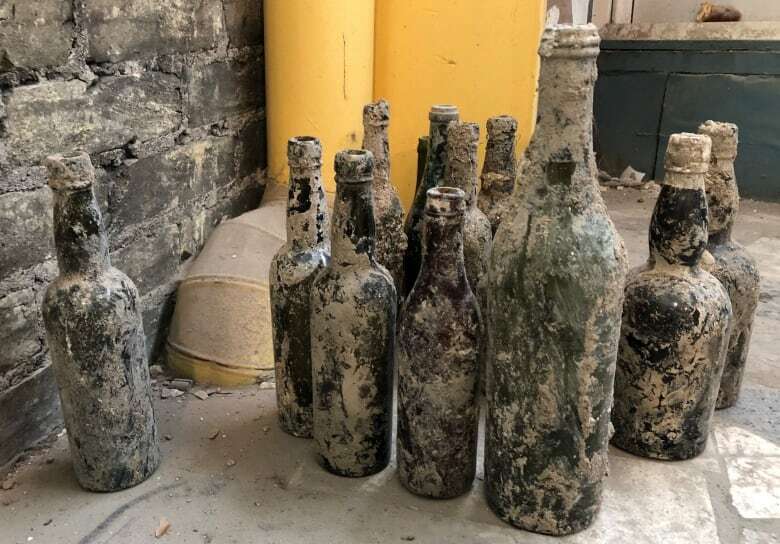 As crews peel back layers of physical material, they've also peeled back years of history, becoming some of the first people to see things entombed for more than 100 years. "It certainly feels special that way," said Pollard's son, Ryan, who is overseeing the renovation. "That log post [structural column] is pretty neat because you sure wouldn't see anything like that today — a giant pine tree that someone cut down, stripped and plunked in there," he said. "You wouldn't just cut down a tree and throw it into the wall of your building." Another interesting find was a harmonica with a stamped date of 1881. 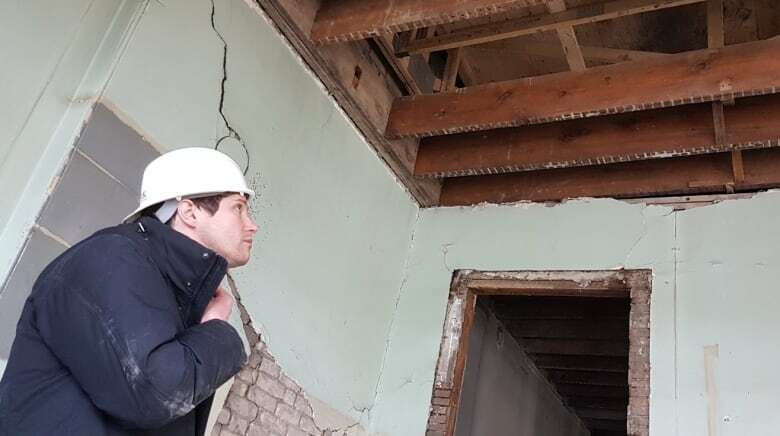 Ryan likes to think it slipped from the pocket of someone working on the Fortune Block and was lost, only to be bricked over and sealed in a wall. He gifted the harmonica to John Scoles, owner of Times Change(d) High and Lonesome Club on the Fortune Block's street level. The bar and live music venue is the only business that still operates out of either the Fortune or Macdonald buildings. 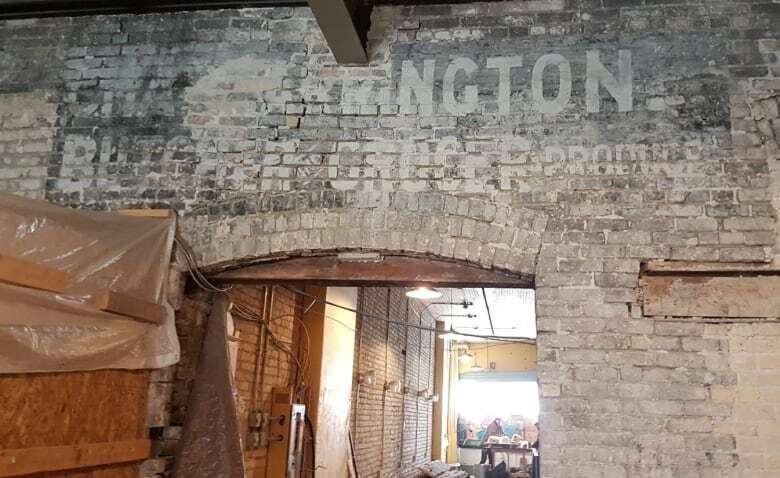 A faded "ghost" sign for a former butcher and grocer that operated out of the Fortune Block was discovered in a space at the back, which had been built out and turned into a garage in the 1950s. It will be preserved and incorporated into the space that will house an expanded Time Change(d), Ryan said. 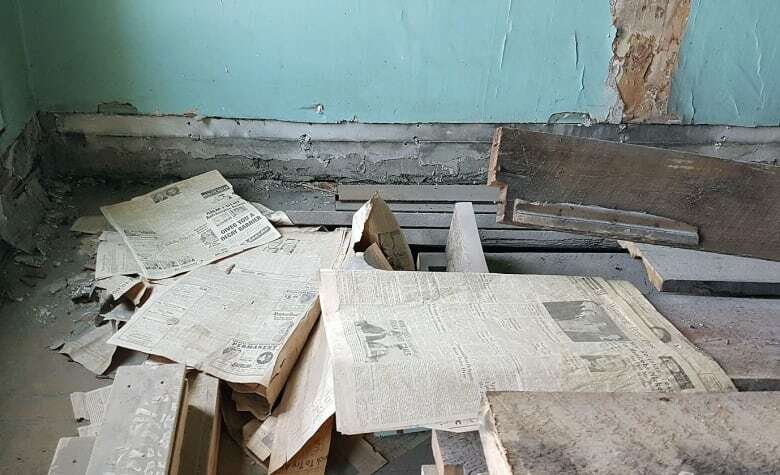 He and his crew have also found "a never-ending amount" of old newspapers in walls and under flooring, as well as numerous bottles buried under the basement foundation. "I feel really fortunate to be a part of it. It's a really cool project," he said, adding he thinks "all the surprises that were waiting to be found have come and gone." He's crossing his fingers that doesn't include the much-less desirable surprises, like those that set the project back several months. Pollard hoped to have the project done by the end of 2017 but the Macdonald Block turned out to be more battered than initially thought. 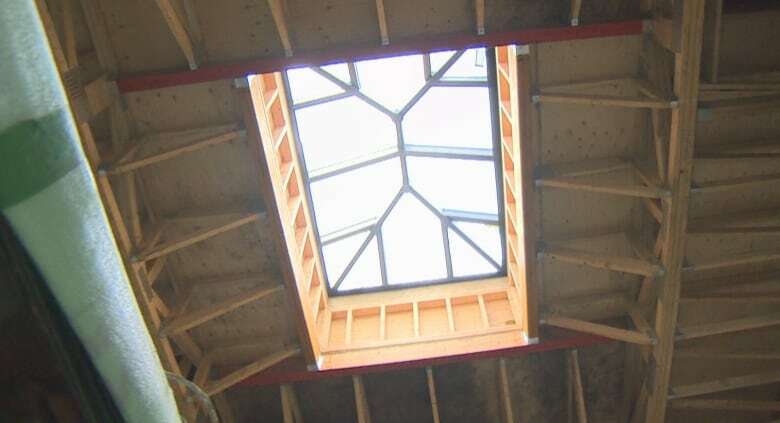 "There was significant structural problems so there was a huge amount of demolition that had to take place. It's really been opened up," Ryan said, noting the upper floors had been unused, with the heat shut off, for about 45 years. They are salvaging as much material as they can to repurpose it in the project. Some lumber from the Macdonald Block has been used to build a new bar inside Times Change(d). 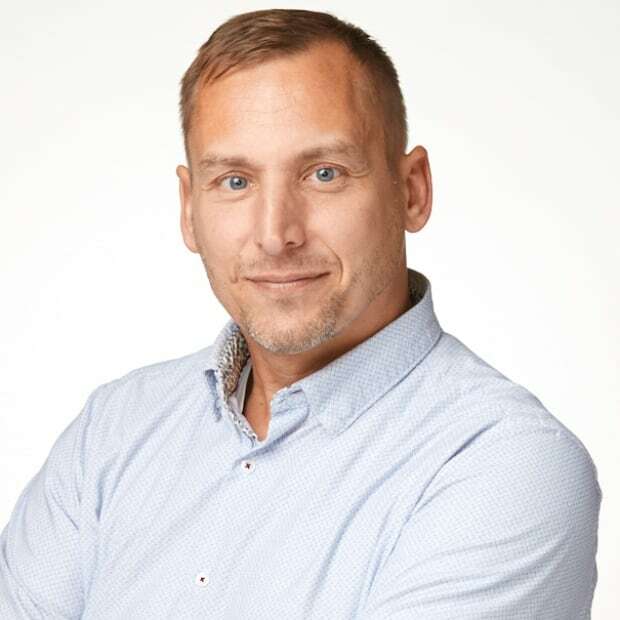 "Extensive, extensive work has to be done," Pollard said, adding that from an economic standpoint, it would have made more sense to tear down the Macdonald Block. But that was not a step he was willing to take. "What we're doing is pretty extreme, but we think it's worth saving and we can afford to do it," he said. "It might be years before I make any money from this, but that doesn't matter." He wouldn't say how much he expects the final bill to be. He did say his expectation going in was to put in about $5 million but "it's going to cost a lot more." The Fortune Block was in better shape but that doesn't mean there hasn't been a lot of work. "When we got in, the ceilings on the top floors were literally caving in, the roof was caving in," Pollard said. But that was easily fixable, compared to structural repairs that must be done in the Macdonald Block. ​"We're still super excited about the building. It just means we lost a few months of working, but now we're in full swing." Because the Fortune Block doesn't need to be gutted, the floor plan will remain intact, as it was 135 years ago. The plan is to "rebuild it inside and out exactly as it was when it opened," Pollard said. To that end, Ryan has pored over archive photos of the building and sketches from a time when horse-drawn carriages passed along the mud street. There were four retail spaces on the main level, and offices on the upper two storeys. That's how Pollard wants it to be once again. The two buildings, however, will be made seamless and function as a single structure with an elevator installed. 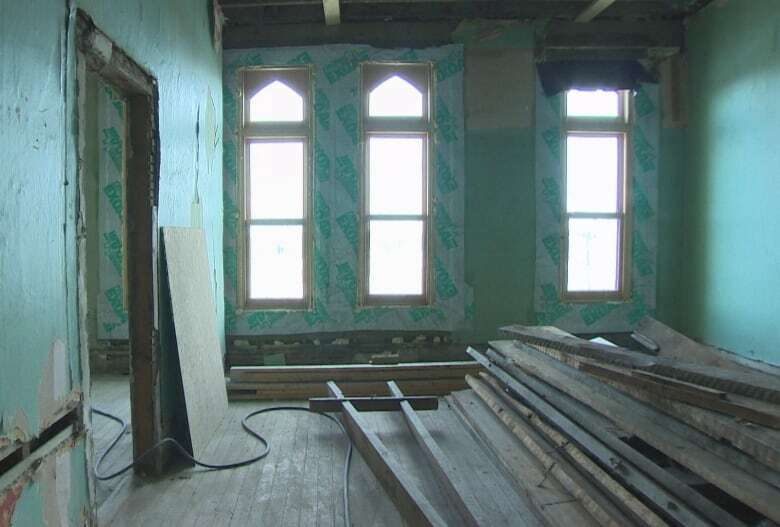 The work is being done by Unit 7 Architecture Inc., which is the company responsible for giving new life to the Marlborough Hotel in downtown Winnipeg. 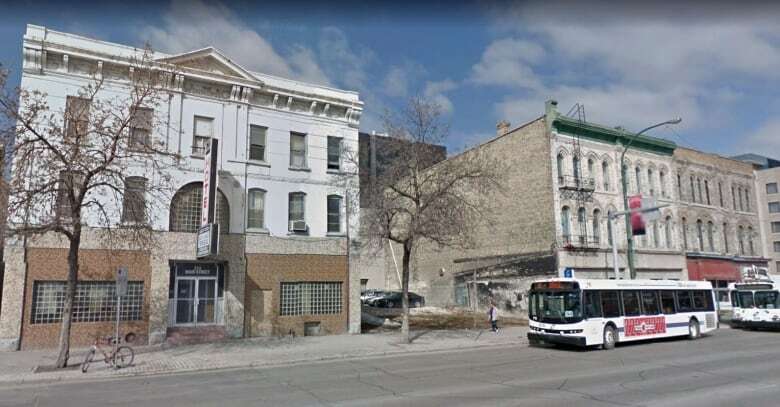 If the Winnipeg Hotel can be saved, Pollard wants to open it as a boutique hotel, and turn the adjacent vacant lot into a summertime outdoor cafe and music venue that can complement Times Change(d). He said it's about contributing vibrancy to the area, which is seeing a resurgence. He noted the refurbishment of the Via Rail train station at the corner of Main Street and Broadway, the opening of the Upper Fort Garry Provincial Park across the street, the nearby Canadian Museum for Human Rights at The Forks, and the 102-year-old Scott Block on Main Street, which was recently renovated and reopened with residential and retail space. "There are things happening around here," Pollard said.